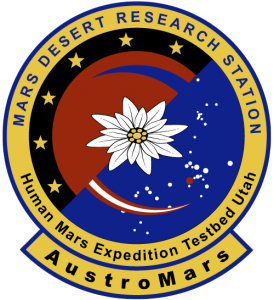 AustroMars was a simulated Mars expedition of the Austrian Space Forum, which was conducted in April 2006 in the desert of Utah. 145 volunteers, 20 research institutions and broad outreach activities made this mission a small milestone within the Austrian spaceflight activities. A crew of six Austrians conducted – in cooperation with the US Mars Society and supported by a satellite link to the Mission Control Center in Salzburg, Austria – experiments in a Mars analog environment for two weeks. These experiments are likely to be conducated during a real Mars mission: geophysics trials, microbiological studies (e.g. Track & Trace contamination experiment) and experiments from the area of pyschology, medcine and astrophysics. AustroMars was a high fidelity simulation of a journey, which will take place in the future to test the technological, scientific and logistic requirements of a future human Mars mission. 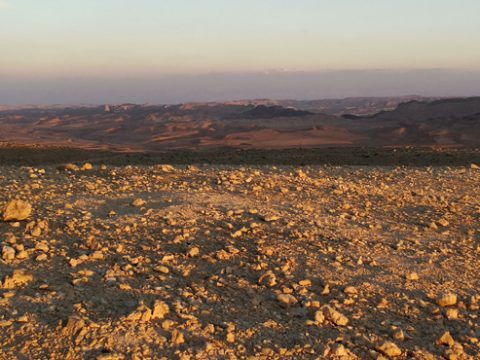 After the end of the simulation in the desert of Utah the sample were analyzed in the subsequent months, test results were interpreted and scientific works were written. These results were presented to the public in autumn 2006 at the AustroMars Science Workshop and are publicized in the MARS2030 proceedings. 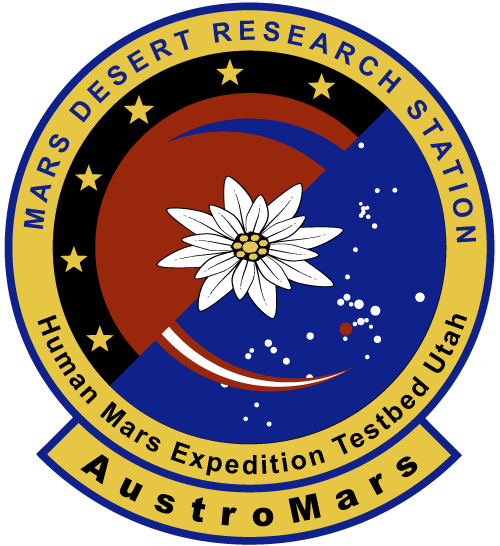 The Austromars mission emblem: the Edelweiss symbolizes Austria, the red and blue discs represent Mars and Earth. During the simulation the planet Mars is located in the constellation Taurus with its red giant Aldeberan. The six stars stand for the six flightcrew members. One arc displays the transport from Earth to Mars, the other one is a reference to Austria. The European and American space organisations started two grand exploration projects with the goal of taking Man to Mars. 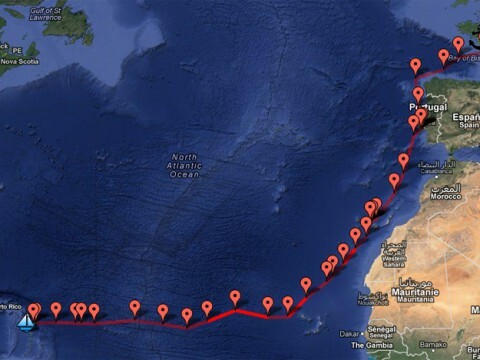 Regardless wether the decision if people will be send to this great voyage tomorrow or in 10 years we have to develope technologies to turn the flight into a safe and cost-effective endeavour. 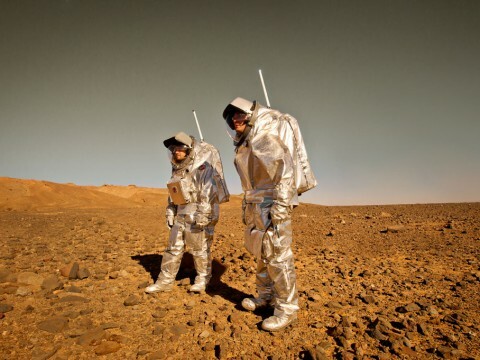 Mars is the next fundamental step of our space flight program: to stimulate the essential technological developments for a mission like this, Mars Society operates a so-called analogue-station in the desert of Utah where short-time missions (two weeks) are being simulated. 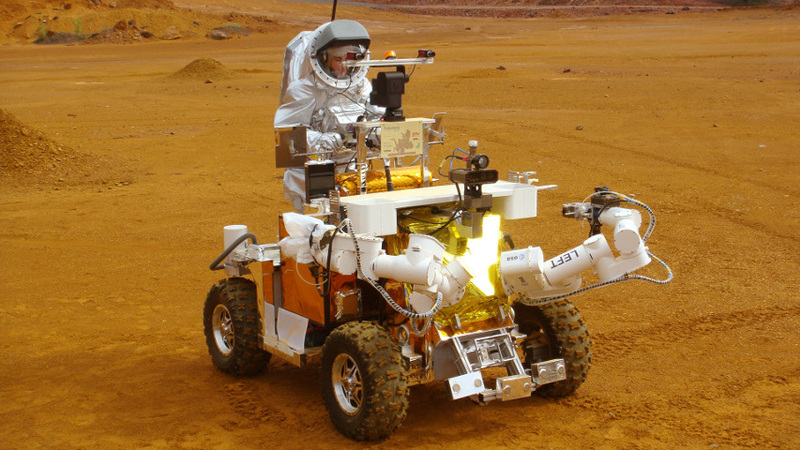 2006 the Austromars expedition conducts such a mission: for the first time the crew, the support team and the experiments as well as the major part of the hardware are from Austria. On the one hand the project consists of research activities concerning the development of strategies and technology for manned mars missions in the future and on the other hand it is a demonstration of the capabilities of the national space capacities. Apart from the scientific stimulus Austromars also focuses the public view on space activities and – closely associated with enormous involvement of the media tightly associated with massive involvement of media – presents a young scientific landscape in Austriabeing a top performer in the field of European space-travel. AustroMars was supported by the Austrian Federal Ministry for Transportation, Innovation and Technology. (BmVIT). Main supporting organisation: Austrian Space Forum (OeWF,www.oewf.org) presents a nationwide network of space flight enthusiasts and people interested in space. It serves as a communication center between the space sector and the public embedded in a worldwide network of specialists from industry, research and politics. Because of its orientation on education and public relations the OEWF has established an important scientific and media orientated network during the most recent years. Dozens of projects like Austria’s largest space contest for youths in 2001, a nationwide exhibition with 12.000 visitors, the Science-Fiction-Week attracting 15.000 visitors, countless lectures and events – among them one of the largest events in Europe about the landing of the space probe Huygens – have been realised and allured an extraordinary echo in the media.